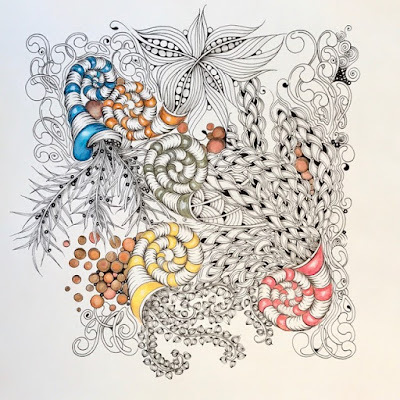 Where do you find inspiration for your Zentangle art? My Opus tile was inspired by the seaweed covering our beach at Bridport. Great composition. 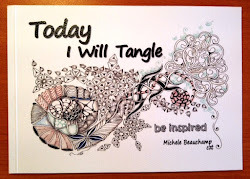 Love the array of tangles and the little bit of color. Absolutely stunning. You are an incredible Zentangle artist. I love this wonderful drawing, especially the way how you integraded Marasu!!! Your "Seaweed" is absolutely fabulous! I love that every time I look at it, I see something I hadn't seen the first 5 times! Thank you for sharing your artistic talent! Really pretty. Love the usage of color! 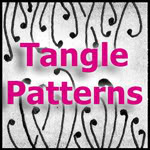 I'm new to this zentangle stuff --- could you tell me the patterns you used to make it?? Hi Chimica, the tangles are marasu with squill, verdigough, punzel, sprigs and mooka.